For the first time that I’ve ever seen for it to be done, this is a children’s book based on a true story. 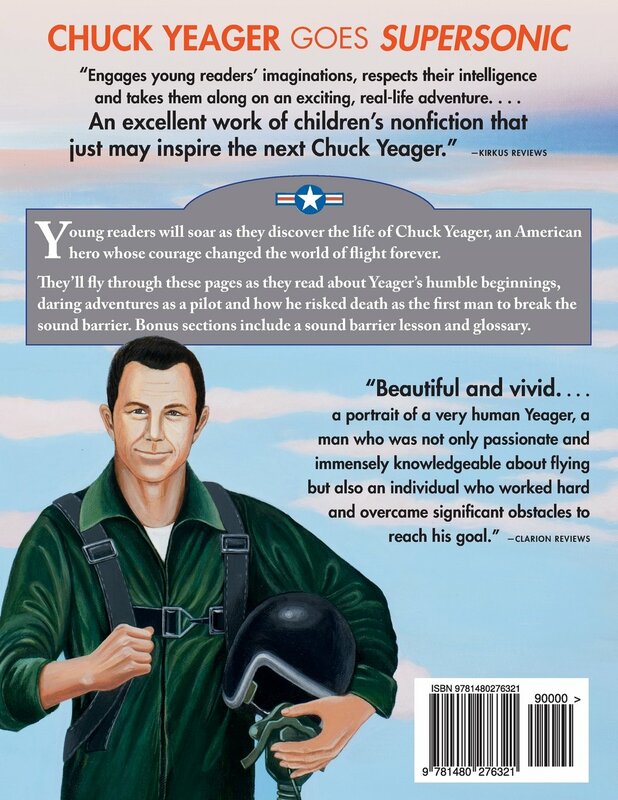 Chuck Yeager Goes Supersonic is written by Alan W. Biermann is actually a story about a man that was raised to be trained to help his dad in the gas fields. Eventually he decided to sign up for the Army. While in the Army he trained as a pilot. The book contains a vocabulary / glossary section at the end. I find that it is also very helpful explaining to children what things are on a plane when you can’t explain it any other way. It also comes with a visual that is illustrated next to each one. That also comes in very helpful. In my own thoughts, I find that it’s very helpful to parents that are raising children while in the military. Some children are to young to really understand and this will help them to really understand what the parent that is enlisted does. It helps them to also know that they should be very proud of the parent that is out for months at a time, fighting for them and our country. It’s perfect for children that are interested in planes and learning to fly. It’s a start to letting them learn what they are all about. This book can be so helpful, visual and even beneficial to many children. This book is written by a college professor. His hopes are to share true stories with children and for them to learn a bit of history with the truth. Mr. Alan W. Biermann has hopes of writing more stories for children to be able to enjoy true stories. His stories are like the ones we use to sit around listening to while we were small children and listening to our grandparents. By writing and doing the illustrations to help smaller children enjoy these stories, I find that he’s got the right idea and on the right track. He’s a great person to talk to as well as to listen to. I loved his book, still do. 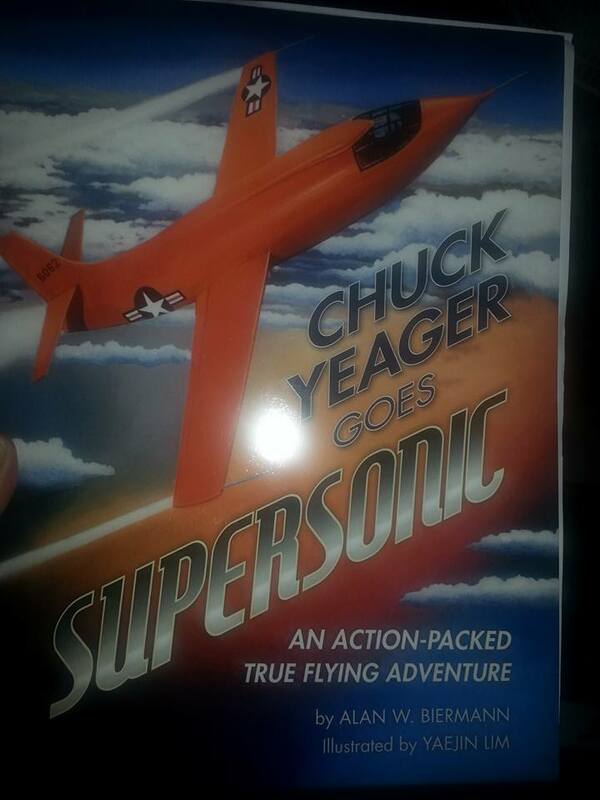 My five year old son loves his book, “Chuck Yeager Goes Supersonic”. Mr. Alan W. Biermann has also written many other books, other than children’s books. Be sure to check them out here! If you’re interested in this book, keep your eyes out for the next one and purchase this one here. You’re helping to support a great author, getting your children into the right side of reading with some very realistic illustrations. They’ll love the art as well as what they will be reading / listening to you read to them. The illustrations were done by Yaejin Lim. I received this for my honest thoughts and review. All thoughts are my own and no other’s. This post may include affiliate links, which means that if you click on them, I might earn a small amount of change if you make a purchase. There is suppose to be compensation for this post, but is not 100% guaranteed.